For a proven, easy-to-follow strategy for giving your lawn the right amount of water, Mohammad, owner of Gardening Angels advises us to follow these eight tips for healthy grass with a deep, strong root system. The morning is the best time to water your lawn because the air is cooler and there’s not usually much wind to blow the droplets. In the middle of the day, water evaporates too quickly. And in the evening, eater can cling to the blades of grass overnight, which can ultimately lead to lawn diseases. A wet lawn at night is the perfect conditions for fungus to grow. For homeowners that can’t water in the mornings before work should do it on a weekend morning. The best times are between 4am and 10am. Water long enough to moisten the soil about 6 inches down – which is the depth of a healthy grass root system. To see how far the moisture seeps down, check the soil every 15 minutes during the first watering. The best way to test is to take a shovel and lift up the sod. Time how long it takes the water to work its way that far down, then water for that duration every time you turn on the hose. Built in lawn sprinklers are the best systems for watering the grass. It’s the most efficient system and will pay for itself in the long run. But for homeowners who don’t have an in ground irrigation system and don’t want to invest in one, use a pulsating sprinkler hooked up to a garden hose – especially for an already established lawn. The sprinkler shoots out the water horizontally at a high velocity so it’s not as vulnerable to wind and evaporation as oscillating types which spray water straight up. 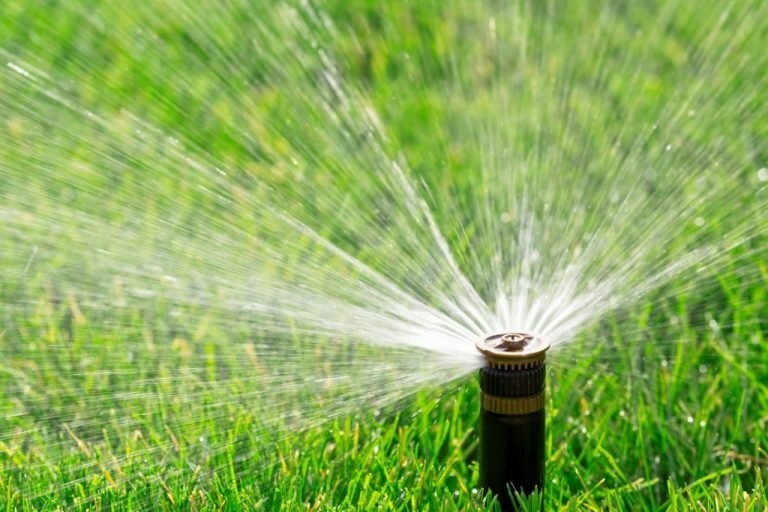 Pulsating sprinklers are ideal for lawns with mature grass, but for new yards, the intense water stream can wash away the seeds. Oscillating sprinklers are a better choice for new lawns until the grass takes root. Water Twice Per Week, Max! It is recommended that watering clay soils should be done once a week and sandy soils every three days. Too much watering can lead to fungus and a shallow root system. Fewer waterings encourage the roots to grow deeper. If you are watching your clock, trying to remember to turn off the water, chances are you’ll forget the sprinklers are running. So look at investing in a timer. They start at about $10 from a good garden supplies business and automatically turn off the water after a designated time to ensure the lawn receives the proper amount of water. The timer connects to the spigot, then the house connects to the timer. If homeowners don’t water their lawn that’s fine. The lawn will go dormant. But letting the lawn go dormant, then watering and then discontinuing the watering again is hard on the grass. By going back and forth between dormant and watering you actually stress out the grass. A dormant lawn will come back to life after a good rain. Lawns in new housing estates where the topsoil has been removed have a soil so hard that water won’t sink in. In that case, homeowners need to water in stages to soften the ground so that the water can work its way down. Water for 30 minutes, let it soak in and then water for another 30 minutes. If you would like further information about maintaining your lawn this Summer, contact the team at Gardening Angels. We will be happy to answer any of your questions. Contact 0467 001 100 and get started today!